Pressure cookers and their commercial counterpart, the autoclave, heat water in an enclosed vessel that achieves temperatures above 100°C (figure 5.3). As heated water in the vessel forms steam, the steam causes the pressure in the vessel to increase beyond atmospheric pressure. The higher pressure, in turn, increases the temperature at which steam forms. Whereas steam produced at atmospheric pressure never exceeds 100°C, steam produced at an additional 15 psi (pounds/square inch) is 121°C, a temperature that kills endospores. Note that the pressure itself plays no direct role in the killing. 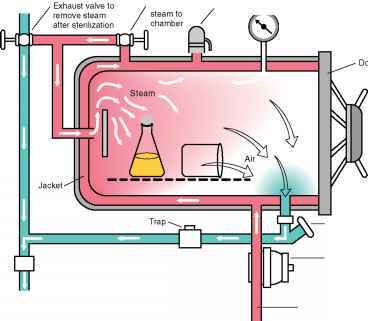 Figure 5.3 Steam-Jacketed Autoclave Steam first travels in an enclosed layer, or jacket, surrounding the chamber. It then enters the autoclave, displacing the air downward and out through a port in the bottom of the chamber. Typical conditions used for sterilization are 15 psi and 121°C for 15 minutes. Longer time periods are necessary when sterilizing large volumes because it takes longer for heat to completely penetrate the liquid. For example, it takes longer to sterilize 4 liters of liquid in a flask than it would if the same volume were distributed into small tubes. When rapid sterilization is important, such as in operating rooms when sterile instruments must always be available, flash autoclaving at higher temperature can be used. By increasing the temperature to 135°C, sterilization is achieved in only 3 minutes. A temperature of 132 °C applied for 4.5 hours is thought to destroy prions. Autoclaving is a consistently effective means of sterilizing most objects, provided the process is done correctly. The temperature and pressure gauge should both be monitored to ensure proper operating conditions. It is also critical that steam enter items and displace the air. Long, thin containers should be placed on their sides. Likewise, containers and bags should never be closed tightly. Attaching tape that contains a heat-sensitive indicator to objects when they are autoclaved can provide a visual signal that items have been heated. The indicator turns black during autoclaving (figure 5.4a). A changed indicator, however, does not always mean that the object is sterile, because heating may not have been uniform. Biological indicators are used to ensure that the autoclave is working properly (figure 5.4b). A tube containing the heat-resistant endospores of Bacillus stearothermophilus is placed near the center of an item or package being autoclaved. 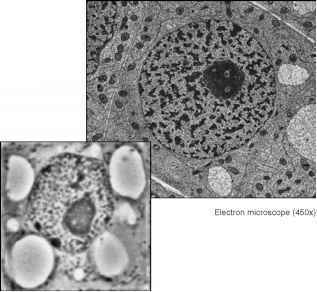 After auto-claving, the endospores are mixed with a growth medium by crushing a container within the tube. Following incubation, a change of color of the medium indicates growth of the organisms and thus faulty autoclaving.